The National Portrait Gallery announced last week that they won't be accepting a £1m grant from the Sackler Foundation to help fund an upcoming redevelopment project, because the family's wealth comes from selling an addictive prescription painkiller. So I didn't visit the National Portrait Gallery yesterday. But I did track down a heck of a lot of galleries and museums who have taken the family's money... and now won't be taking any more. 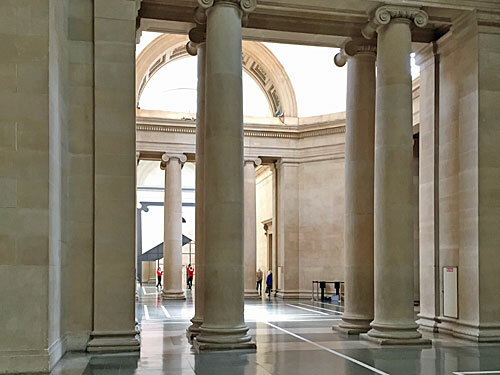 This is the Great Court at the British Museum, sensationally revamped by Foster and Partners at the turn of the century. 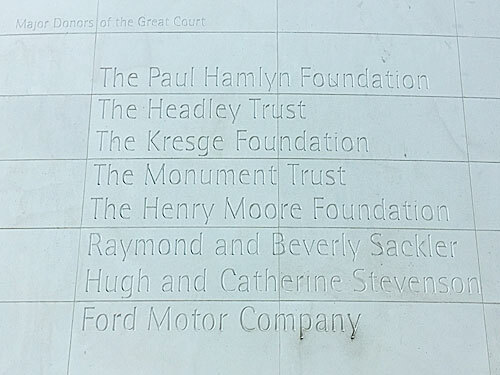 Numerous benefactors are chiselled into the wall of the Reading Room, including two Sacklers, the Ford Motor Company, the Maurice Wohl Charitable Foundation and "the Weston Family", whose name is bigger than everyone else's so probably donated the most. 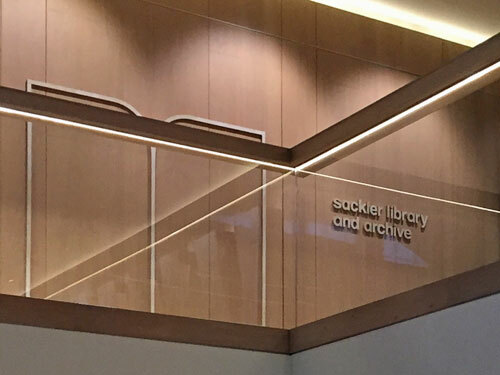 The Sacklers also sponsored the Raymond and Beverly Sackler Seminar Room in the education centre in the basement. Back in 2000 nobody minded that the Sacklers' cash came from shamelessly flogging addictive painkillers, but times change. This is the Sackler Library and Archive at the Design Museum in Kensington. An entire wall in the entrance porch is given over to naming the generous souls who helped the trustees reconfigure the former Commonwealth Institute, and it's hard to find a space inside that isn't named after one of them. Around the main atrium, for example, are the Weston Mezzanine, the Swarovski Foundation Centre for Learning, the Kirby Laing Studio, the Chumsri and Luqman Lounge and the Helene and Johannes Huth Gallery. The only unsponsored spaces on the first and second floors are the restaurant and the toilet. This place would not have opened in 2016 without rich people's dosh. This is the Sackler Hall at the Museum of London, otherwise known as the cafe. It's part of the Galleries of Modern London, which are downstairs, opened in 2010 after a £20m refit. 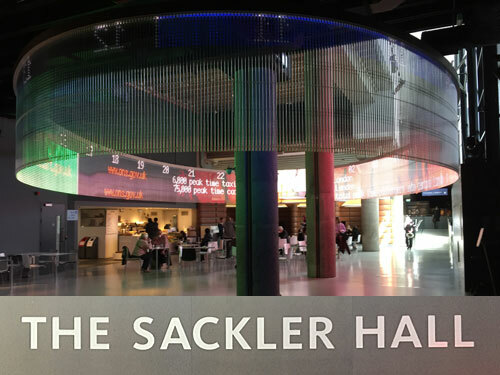 You may have walked through several times without realising this was a Sackler space, but their name is emblazoned on one wall beneath the elliptical data screen, along with a plaque thanking family members for their generosity. During the day this area is simply somewhere to stop and eat, but in the evening it doubles up as a flexible entertainment space to rake in additional money for the museum, so this donation's proved sustainable. This is the Sackler Room at the National Gallery. It's where you go to see the Hay Wain and the Fighting Temeraire, plus George Stubbs's racehorses, so it's pretty prestigious. 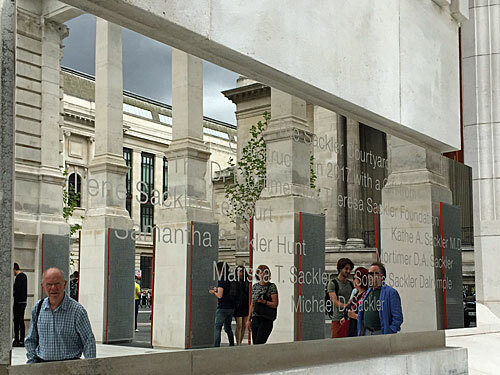 The Sackler Family got their name up on the wall here as early as 1994 thanks to what they described as "A Gift To The People Of The United Kingdom". 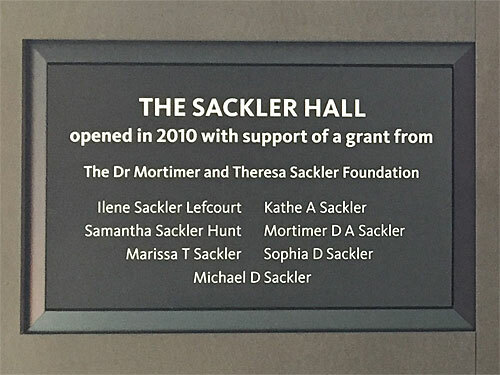 Intriguingly the plaque went to the bother of listing all the relevant Sacklers, namely Dr Mortimer, Theresa, Ilene, Kathe, Samantha, Marissa, Sophia and Michael - exactly the same list as appears on the wall in the Museum of London, but in a different order. This is how you get between floors at Tate Modern. The Sackler Escalator rises up inside the original building, opened in 2000, and is only named at the very top which may be why you've never noticed the name. 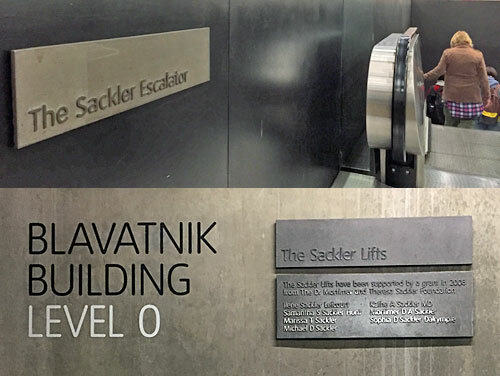 Meanwhile the Sackler Lifts ascend inside the 2016 extension, with a plaque on the ground floor listing the same seven members of the family that we've seen elsewhere. Tate Modern is an incredibly benefactor-friendly art gallery, in which the Maria and Peter Kellner Bridge leads from the Eyal Ofer Concourse to the Blavatnik Building... at least partly balanced by the main building having been recently renamed after a Southwark activist who paid nothing. This is the Sackler Octagon at Tate Britain. It's at the centre of the central space, part of the Millbank Project (2011 – 2013) which "created new spaces for display, education and social activities". It's not somewhere for paintings, more for sculpture or performance art, and can also be used as a dining space for up to 120 corporate guests should the opportunity arise. 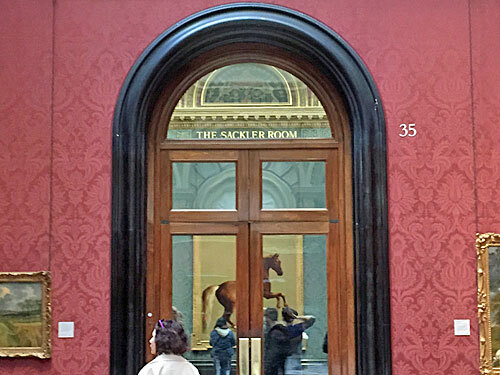 The Tate's board of trustees announced last week that it would be declining further donations from the Sackler family, in an attempt to take the ethical high ground, but they do already have an Octagon, an Escalator and some Lifts so the horse has definitely bolted. This is the Sackler Serpentine Gallery in Kensington Gardens. 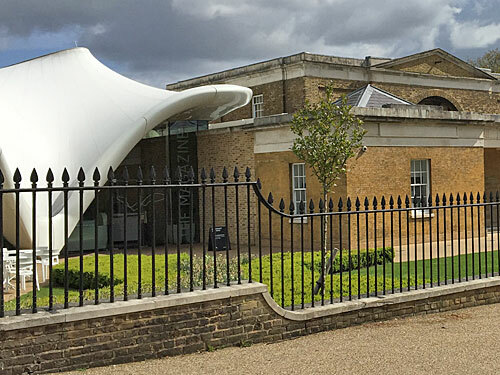 It's a partner of the original Serpentine Gallery but in a completely separate building on the other side of the Serpentine, a converted gunpowder store which opened in 2013. The biggest donation the Galleries have ever received came from Dr Mortimer and Dame Theresa Sackler, which is why the new building has their name slapped across it - a move which once looked benevolent but now associates the space to a toxic bequest. If the Sacklers' intention was to shower London's art scene with cash in an attempt to appear culturally virtuous, that approach now looks morally bereft. This is the Sackler Courtyard at the V&A. It's the absolute showpiece of the Exhibition Road extension opened in 2017, which includes the world's first all-porcelain public courtyard and a lot of snazzy empty space. All the usual members of the family get a namecheck, but on a mirrored plaque this time for a bit of variety. This'll be one of the last splashes of cash the Sacklers give to the arts in London, now everyone's decided they no longer want tainted money, so this courtyard might be the opioids' farewell. 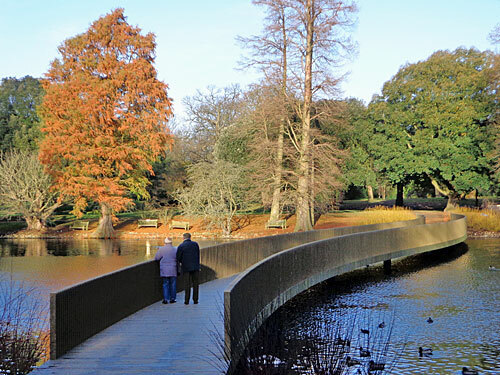 This is the Sackler Crossing in Kew Gardens. It spans a lake in an intriguingly sinuous manner, and has done since 2006, thanks to the generosity of a family fortune based on painkiller addiction. I didn't visit Kew Gardens yesterday because it costs £18 to get in, but it's probably relevant that every other building I've mentioned so far can be visited for free. Museums and galleries have to get their funding from somewhere, and if it's not coming in entrance fees then the deep pockets of exceptionally rich billionaires will have to do. I also didn't head inside the Royal Academy to see the Sackler Galleries, dig further into the V&A to find the Sackler Centre for arts education, sneak into the Natural History Museum’s former Sackler Biodiversity Imaging Laboratory, nor pop into Westminster Abbey to see the stained glass window dedicated to (and paid for by) Dr Mortimer Sackler. This dubious family has ingratiated itself deep into London's cultural offering, for better or for worse, and we''ll be wandering round and admiring the things they've paid for for many years to come.